The Diamondback Fitness 910SR Recumbent Exercise Bike has been the Official Fitness Professor Best Buy for the last six years in a row for the best recumbent bike under $1,000. Not many pieces of exercise equipment claim that! One look at the feature list below and you’ll see why users love the Diamondback 910SR Recumbent Bike so much. 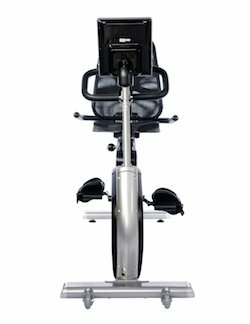 This recumbent bike features incredible workout variety and ancillary comforts that will keep you sticking to your workout routine day in and day out. Unless some fitness company steps up and can at least match what Diamondback Fitness is doing on this recumbent, at this price, they’ll be on top for another six years. We’ll flesh out the pros and cons of of the Diamondback 910SR in our full recumbent bike review below. Click here to see the price of the Diamondback Fitness 910SR Recumbent Exercise Bike on Amazon. The frame and brakes have limited lifetime warranties. Diamondback Fitness explains on their website that “limited lifetime” actual means five (5) years. It also has three (3) year warranty on the electronics and parts, a one (1) year labor warranty and a 90 day wear items warranty. Shipping costs for this Diamondback recumbent bike will vary in price depending on where you purchase from and what type of delivery you prefer. However, if you purchase through Amazon.com, shipping may be free for the Diamondback recumbent bike. Assembly of the Diamondback 910SR is easy, it just takes some time. On average, it will take two hours to put together. Founded in 1991, as an off-shoot of the legendary bicycle company, Diamondback Fitness was born as a means to maintain conditioning indoors and for people looking for new and different cross-training options. For over 20 years, Diamondback Fitness has grown its brand by offering a full line of upright exercise bikes, recumbent cycles and elliptical trainers with superior value and quality. It’s easy to see why the Diamondback 910SR Recumbent Bike has been a Best Buy choice for the last six years. For the features that it has, it is honestly priced very well. An upgrade from the similar but lower-priced Diamondback 510SR, we really like the 32 ECB resistance levels, the customizable handles and seat, the magazine rack and the mobile device input source of the 910Sr. Best the best features by far are the number of pre-programmed workouts on this bike and the heart rate monitoring capabilities. These are extras that you can’t find on recumbent bikes that will cost $500-600 more. 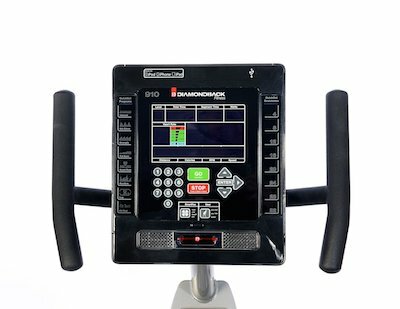 The Diamondback Fitness 910SR Recumbent Exercise Bike has 35 pre-loaded workouts. That is awesome. We love these workouts because they can make exercising really enjoyable. They take all of the guess work out of ensuring you get an intense workout while you’re on the 910SR Recumbent Exercise Bike. These workouts include categories like fat burning, strength building and hill climbing, but our favorites are the six interval workouts and the six heart rate workouts. These are the two workout groups that will really get you in shape fast and burn those excess calories. Diamondback Fitness provides two different options on the 910SR Recumbent Bike for monitoring heart rate. You can use the stationary handles or you can use the heart rate chest strap. The chest strap capability is a nice upgrade in that it allows you to really focus on your workout. The chest strap also provides a continuous and more accurate heart rate reading. The console comes with six pre-loaded heart rate workouts that can be used with either of the heart rate monitoring options. 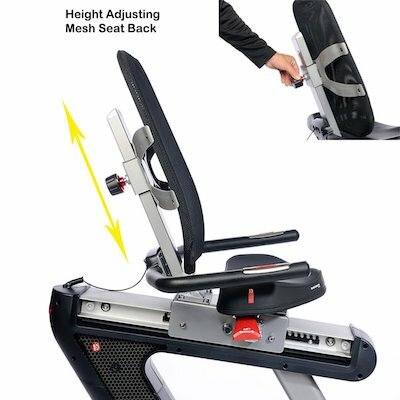 It must be noted that Diamondback Fitness does not provide you with the actual chest strap with the purchase of the 910Sr Recumbent Exercise Bike. You can, however, add a compatible chest strap to your order for another $45. Now a lot of people might not care, but if the Diamondback 910SR Recumbent Bike is missing one thing, the capability to download workout data is it. With all of the workout features and connectivity of mobile devices, you would think this machine would also allow you to download your workout information. This is a nice feature because it allows you to track your performance and measure your improvements. A lot of competitor models at this price range also don’t provide this feature, but there are some that do. It’s easy to see why the 910SR Recumbent Exercise Bike has been a Best Buy machine six years running. It’s packed full of great features like connectivity of mobile devices, heart rate monitoring, many resistance levels and even more programmed workouts. The downfalls are hard to come by and not that dissimilar than competitor models. The Diamondback 910SR Recumbent Bike will not let you down. Recommended.